Completed British 16th and 17th C, except portraits 5 comments Is this work of Venus & Adonis and by Frans Wouters? This is not of Diana & Actaeon, but of Venus & Adonis. It is surely by Frans Wouters, or, if not by him, by another early 17thC Flemish artist combining elements of Rubens and Titian in a small scale on panel, as he did. Collection comment: The picture is currently out on loan, but the suggestions regarding the artist and subject look plausible. We’ll look into the matter further. Frans Wouters (1612–1659) is now listed as the artist of this work, and title has been amended to 'Venus and Adonis'. These changes will appear on the Your Paintings website by the end of November 2014. Thank you to all for participating in this discussion. To those viewing this discussion for the first time, please see below for all comments that led to this conclusion. Frans Wouters looks very plausible indeed and a lovely one too. oil on panel (35.3 x 46.4 cm.) with an old collector's seal (on the reverse); and stamped with the panel maker's mark. Sale 5858 lot 134 Old Masters & 19th Century Art 10 July 2009 London, South Kensington, Christie's. Provenance Anonymous sale; Christie's, London, 9 July 1993, lot 156. 2) 'A WOODED LANDSCAPE WITH VENUS, ADONIS AND CUPID' oil on copper, 57.3 by 74 cm. Old Master Paintings Sale: L08030 LOT 35 Sotheby, London, New Bond Street 12 Feb 2008. 3) 'Venus trying to prevent Adonis from going hunting', oil on panel, 40x56.2 cm, Christie's, New York [NY], 1997-01-31, lotnr. 10 (record RKD 19263). My Digital Thematic Research Collection lists 12 works attributed to Frans WOUTERS with topic 'Venus and Adonis'. I have carried out a desk-top check, and this work is one of a small group of Old Master paintings acquired as part of a room contents by St Fagans: National History Museum (then the Welsh Folk Museum) in 1953. It was listed at the time as Flemish, 17th century, perhaps by Jordaens and Snyders. Having reviewed the comparisons above, and the work of Wouters more widely, I think we should accept this attribution, and my colleagues at St Fagans: National History Museum are happy to do so. I am looking forward to seeing the work which is out on long loan, and I am grateful to Art Detective and to those who have commented on it. 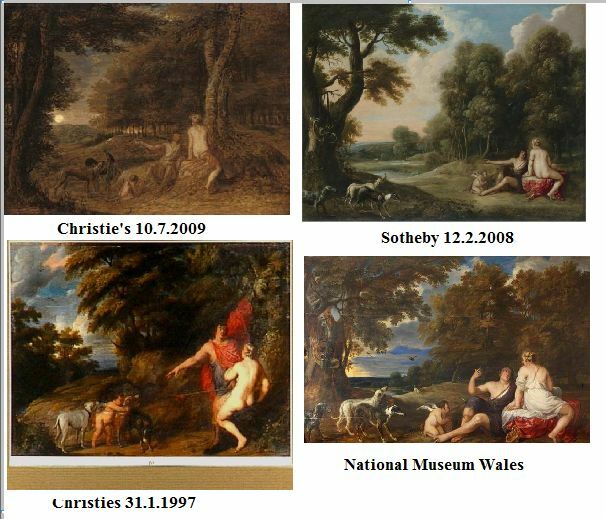 If Oliver and his colleagues at Amgueddfa Cymru are happy to accept the attribution to Wouters, and the change of subject to Venus and Adonis, on the strength of these comparative works from Wouters' oeuvre, I'm happy to recommend that these changes are made, and the discussion closed - many thanks!